Starring Jock O’Mahoney and Dickie Moore. Widely known as Buffalo Bill, William Cody helped define the image of the Old West and became one of the best-known celebrities of the 19th and early 20th centuries. 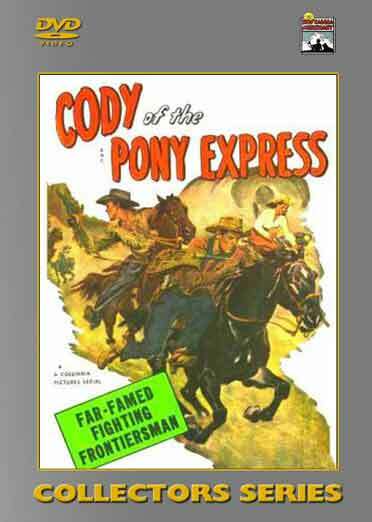 As a teenager, he herded cattle and rode vast distances for the Pony Express in order to support the family. Its plot centers on a young Cody joining forces with the Lieutenant Jim Archer to battle an outlaw gang secretly headed by Mortimer Black, an unscrupulous lawyer who is tempted by greed into a series of crimes leading to murder. – 2 DVDs – 15 Chapters – 1950.